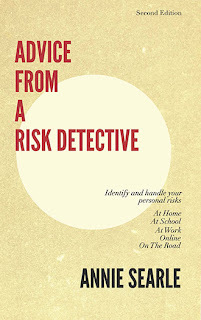 Advice From A Risk Detective: Happy Fifth Annivesary! Here's a look back at my blog post from July of 2009, where it all started with the launch of ASA's website and a celebration. As I mentioned yesterday, the launch party was a grand event. All design and details were handled by Lauren. She persuaded photographer Weston Jandacka to come and shoot the first two hours of the party. These are all his photos. Lauren and Leroy guarding a tray of chocolate dipped strawberries and Trader Joe's cashews. Mike, Annie and Shelby Edwards. From the left: Bruno Langevin, Bo Hok Cline, Julie Hillers, Annie and Karen Pierce, right foreground. Al Wilson is in the background. Shelby Edwards and Fred Pursell. Greg Harp greets former colleague, Kris Jorgensen. The First and Union web team....Sherry Stripling, Rick New, and Molly Martin. Annie and visual artist/architect Bo Hok Cline. There are always folks in the courtyard, near the food and drink. Left to right: Molly Martin, Eric Holdeman, Al Wilson, Annie. Greg Harp, Kris Jorgensen, Steve Hankel, who drove up from Portland. Al Wilson and Greg Harp. Me and my former boss, Deb Horvath, who is always there to support me. Here are the co-conspirators looking a little punchy: Annie and Lauren, who has made this launch and my summer a truly memorable experience. Last but by no means least. Tracey Graham. one of my former team, now leading the Washington state financial coalition. She presented me with a three legged frog who has coins in his mouth for good fortune. When we are in the office, the frog looks out the door. When we leave, we face the frog into the office, so as to maintain our good fortune. It is a pleasure to have friends and colleagues such as those pictured above, especially when you have known many of them through various cycles of their lives. For a few more thoughts on what we have accomplished this first five years, and how things are about to evolve next month, please take a look at my personal blog, "A Walker's Journal."